Real estate in University City has a bit of a stigma. 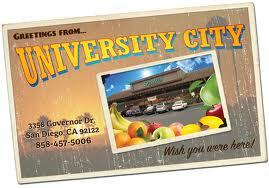 Some people think it’s too close to UCSD (University of California San Diego). Some people think that proximity to the university means that things like crime, poverty and property value are all issues. I hate to burst those people’s negative little bubbles, but the truth of the matter is, they’re wrong. University City is one of the nicest areas of San Diego, full of amazing buying opportunities set at some of the best prices in all of San Diego City. Homes for sale in University City are not going to break the bank. You’re not going to be saddled with a monster of a mortgage and spend the rest of your life paying off a house that your bound to go under on. Not only is that not going to happen, but if you’re buying a house in University City than you’re moving into one of the most fun neighborhoods, not just in California, but in the whole country. And not for the “college town” reasons you might think. Yes. There ARE a slew of bars and cheap restaurants in University City. They themselves are fun, for sure. But that’s not all University City has to offer a home buyer. University City is smack in the middle of the some of the best hiking, biking and walking trails in the state of California. Some of the mesas and canyons in their area are Rose Canyon, San Clemente Canyon and smaller finger canyons that can make any outdoorsy type feel right at home and far away from the big city life. Condos for sale in University City are in great supply. You can imagine that these smaller, affordable homes make perfect sense in a college town. Here you’ll find some fantastic communities full of some amazing people. The condos are often filled with professors from the University and graduate students. So your neighbors are most likely to have a lot to say. It’s not everywhere you can find a neighborhood filled with great people capable of great conversation. Here in University City, you’ll find comfort and a lot to do. Let OpenOffer.com start negotiating you’re new home in a great part of town.